Menlo Technologies joined 16,000 Microsoft partners, employees and industry experts for Inspire 2018, Microsoft’s worldwide partner conference which took place last weekin Las Vegas Nevada. The 5-day conference was highlighted by information sessions and keynotes by leading Microsoft executives. It wasn’t until day three that we heard from CEO Satya Nadella, who walked on to the stage to thunderous applause, and for good reason. Microsoft partners generated nearly $1 trillion in revenue over the past 12 months, thanks to customer demand and satisfaction. So what’s next for Microsoft? “A profound shift to a new way of doing things,” said Nadella. The Intelligent Edge bridges the digital and real world—enabling you to deliver a seamless experience and compute capabilities wherever your data exists—in the cloud or offline. Nadella called recent advances in AI have been “pretty stunning” in terms of how they’re reaching parity with human perception and language capabilities. The potential, he said, is for Microsoft to be able to turn every industry into an AI-first industry — whether it’s retail or health care or agriculture. Their key goal is to make sure that compute is available in the remotest of locations. The manual operations have a digital feedback loop to provide accuracy, so they deploy Azure Stack where the data is being generated– where the AI needs to actually have the reasoning power. Nadella showed how his workday revolves around the Microsoft 365 suite, which includes Office 365 productivity apps and Windows 10. Along with using Outlook (which Nadella described as “the best Gmail client”), he emphasized how the Teams app has come to dominate his daily collaboration with his inner circle. Microsoft has been heavily promoting Teams, a competitor to Slack, and launched its first free version of Teams last week in connection with Inspire. Nadella also pointed to his own use of the Cortana virtual assistant — which has a “commitments” feature that reminds him of things he’s committed to doing but hasn’t put into a to-do list. Commitments is “one of the features that saves me every day,” he said. Dynamics 365 — Microsoft’s combination cloud CRM and ERP system — saw 65 percent growth during the first three quarters of the company’s fiscal 2018 (Microsoft’s fourth-quarter results come out Thursday). That makes it one of Microsoft’s fastest-growing businesses, even faster than Office 365. Microsoft executives this week announced a number of new ways they’re working to assist partners with getting involved with Dynamics 365, as well as with other business applications such as Power BI data visualization. During his Inspire keynote, Nadella said that Power BI is “one tool that’s changed the culture inside the company,” thanks to the way that it helps bring the focus to leading indicators rather than lagging indicators. Want to read the transcript from Satya Nadella’s keynote? You can read it here. 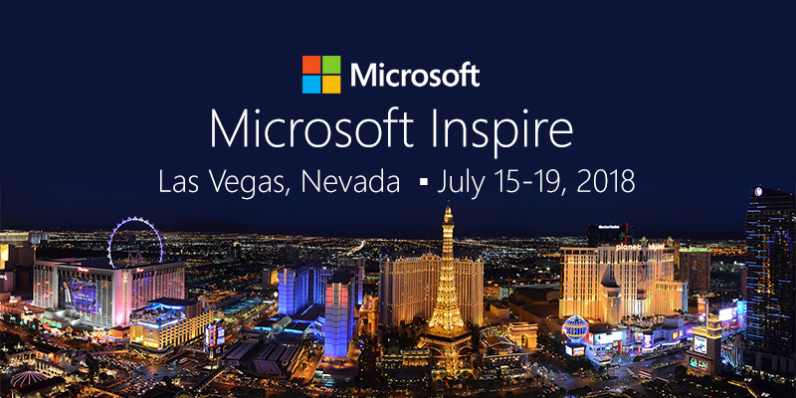 There was a lot of great information at Inspire 2018, and we’d love to share our experience with you and demonstrate how Microsoft solutions can accelerate your digital transformation.